Webswitch 1216H is a remote controlled switch with 5 relay outputs (230V/16A) which can be controlled independently via the built in home page from any network connected device having a web browser(PC, Smart phone, etc). There are also Apps available for Android . The Webswitch is fully standalone and is connected directly to the local network. The Webswitch is available in three editions, Home Basic, Home Extended and a Ham radio edition. The Webswitch Home Extended edition has all the functionality of the Home Basic with the addition of the possibility to be equipped with a radio module enabling control of remote switches(Nexa) in the same way as the built in relays, as well as software functions for automatically control of the relays based on time, temperature or light and a software function called “Car Warm Up” that based on time and temperature turns on the electrical heating of a car’s engine and/or coupé. The extended version also have Monitoring functions for sending email/SMS when for ex. the temperature changes as well as the possibility to use other Webswitches’ inputs and outputs. The Switch fits into a standard DIN-rail system (6M). There are lot of cheap DIN-boxes which can be used for outdoor installations. Supports both 10 and 100 Mbits Ethernet networks. Setup via USB or a phone App using a Windows PC and the Microbit Setup Manager software makes the initial setup of the network settings easy. Supports up to 25 1-Wire bus devices (BUS-A, BUS-B), for ex. temperature sensors. Built in DynDNS Client for easy host name based access from the Internet. The Webswitch’s internal software(firmware) can easily be updated, either via the web interface or via USB using the Windows based Microbit Setup Manager software. The settings can be both exported and imported. Can send emails or SMS when for ex. temperature goes below/above a programmable level. 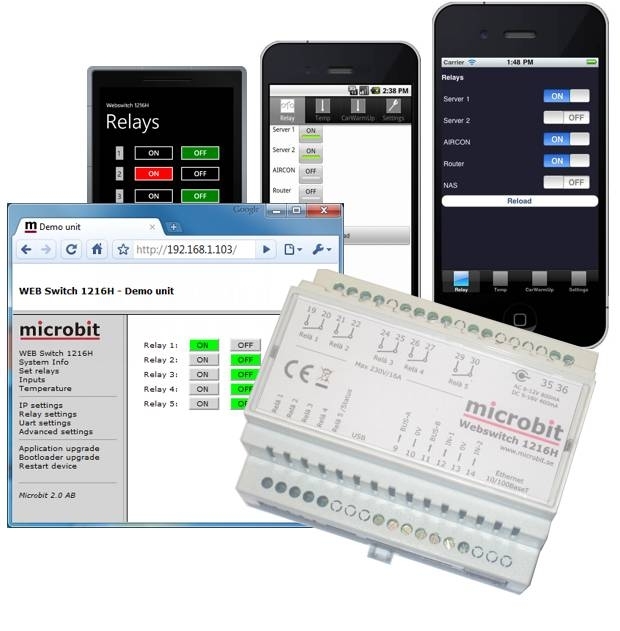 Mobile Phone Apps for Iphone, Android and Windows Phone available for remote controlling the Webswitch. Note that if you intend to connect high-voltage devices(for ex. 220-230 Volts) directly to the Webswitch, depending on your country’s regulations and laws, you might have to consult a authorized person(electrician) for the installation.